1. wxFormBuilder won't let me put a wxBoxSizer in a wxPanel. It insists that the wxSizer goes in the wxFrame. 2. It won't let me put a wxSplitterWindow in a wxPanel or a wxAUINotebook. Unless it's been fixed recently (I've not used it for a couple of years) wxFB stupidly won't let you put a control such as a panel directly into a frame; it insists on frame > sizer > panel. I suspect that's what it's complaining about here. In other words, wxFormBuilder is not a very good guide. It's second-best IMO (I now use wxCrafter). However it's easy in wxFB to add a sizer to the frame, and put the panel into it. It does no harm, it's just not needed. I love formbuilder, but I suppose it can be a bit picky about what it allows to be a child of certain controls. I think the only children in allows for notebook pages are panels. So you'll need to add a panel to serve as the page and then add the splitter as a child of that panel. 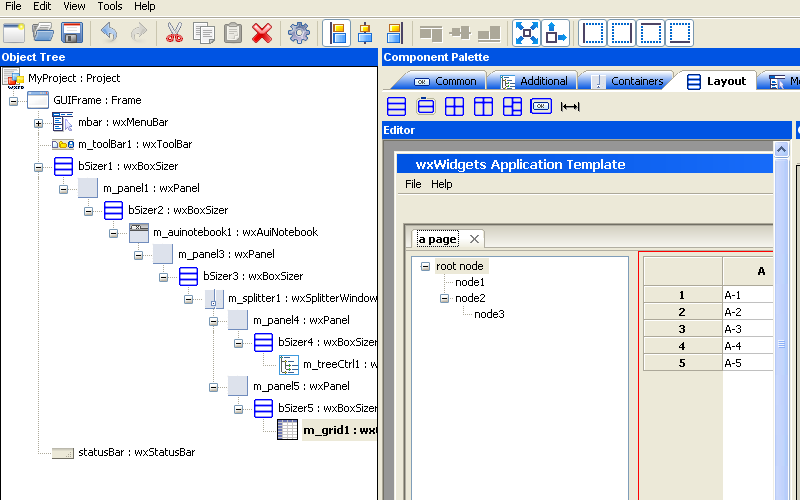 Incidentally, if the notebook is expanded and stretched and has no border, you could add it directly to the frame's sizer (bSizer1 in the picture above) and skip the application panel (m_panel1 in the picture above). New Pagodi wrote: I love formbuilder, but I suppose it can be a bit picky about what it allows to be a child of certain controls. Thanks. Though that seems to be a lot of sizers and panels. Is there settings or something I need to add to the BoxSizer before it will receive a panel? Use the wxPanel item under the "Containers" tab. You're trying the an a Panel item from the "Forms" tab. The items on that tab are meant to be top level windows and can not be children of any other windows. wxPanel item under the "Containers" tab worked, searched for this solution from few days..